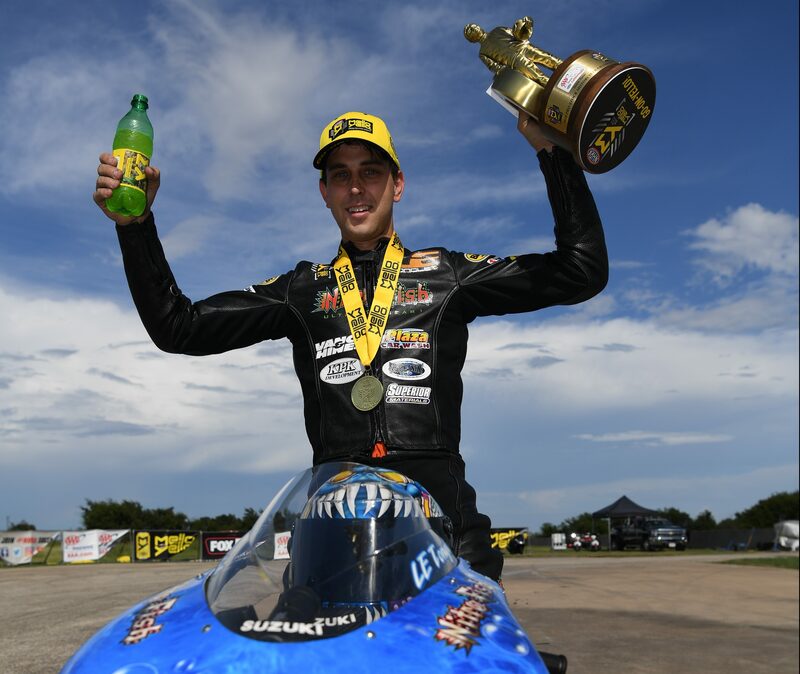 In Pro Stock Motorcycle, Tonglet earned his fourth victory of 2018 and 20th of his career with his run of 6.892 at 194.80 to team owner Jerry Savoie’s 6.907 at 193.88 at the AAA Texas NHRA Nationals at Texas Motorplex. Tonglet took the points lead after his second win at the track on his Nitro Fish Racing Suzuki. He picked up round wins against Andrew Hines, Angelle Sampey, and defending world champion Eddie Krawiec en route to the finals. The NHRA Mello Yello Drag Racing Series continues Oct. 12-14 with the fourth race in the Countdown to the Championship, the NHRA Carolina Nationals at zMAX Dragway in Charlotte, N.C.
195.36 def. Andrew Hines, Harley-Davidson, 7.138, 193.35; Steve Johnson, Suzuki, 6.972, 192.11 def. Hector Arana, Foul – Red Light; Angelle Sampey, Buell, 6.915, 194.38 def. Scotty Pollacheck, Suzuki, Broke; Kelly Clontz, Suzuki, 7.194, 189.47 def. Hector Arana Jr, 11.191, 73.65; Eddie Krawiec, Harley-Davidson, 6.890, 196.10 def. Anthony Vanetti, Buell, 7.147, 178.52; Karen Stoffer, Suzuki, 7.045, 189.31 def. Matt Smith, 6.960, 195.14; QUARTERFINALS — Johnson, 6.942, 191.78 def. Clontz, 7.122, 188.67; Savoie, 7.011, 191.16 def.